When it comes to strength training and women adding muscle there a lot of myths and fear (yes fear) out there. Myths may be obvious but what “fear” you say? Common muscle myth #1: Lift heavy and you will get bulky. If you have ready my site at all, you will know that I encourage my clients and all women to challenge yourself with weights – that is how you see progress! Strength and chiseled muscles are not products of light weight training. Unless you are taking certain supplements and training hours everyday, you will not get big. In fact you will get leaner, stronger and way more defined by picking up the heavier weights. Of course if you are new to weight training it is okay to go light to learn proper form and technique, but keep progressing with the weight for optimal results! 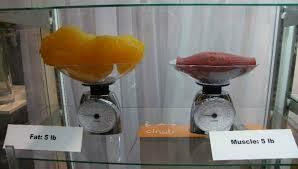 Check out the space size for 5lb of fat vs. 5 lb of muscle! Common muscle myth #2: If I stop exercising my muscle turns into fat. Whoa… what a horrible thought that is! In fact muscle and fat (adipose) tissue are two completely different types of tissue making this myth impossible. However, if you stop or decrease your training your muscle cell size may decrease. On top of that if you don’t lower your daily calorie intake to fit your new activity level those fat cells will start increasing. Muscle cell size decreasing and fat cell size increasing will make you feel like your muscle turned into fat, but that is not how it works. Just keep training! Common muscle myth #3: I could never gain enough muscle to make a difference in my metabolism. With regular and challenging weight training (2-3 times a week 30 min-1 hr) the average woman typically gains 1 lb of muscle a month. Each pound of muscle burns 30-50 calories (there is still scientific debate out there on the actual number). If you only gained 1 pound of muscle the whole year you would automatically lose 3 lbs. Also, if you gained 10 lbs of muscle in a year you would burn an additioanl 49, 500 calories (assuming a 30 calorie burn per 1 lb of muscle). This equals to a 14 lb weight loss for the year. Not bad right? So don’t pass on by those free weights at the gym! I know it seems more like a place for the guys, but it’s not. To achieve you goals get out of your comfort zone and pick up some weights. When other women see you there, they might just decide it is a place for them too. You never know who you may be motivating, so go add some muscle! I have joined your rss feed and look ahead tto seeking extra of your magnificent post. Thank you ! I am glad you enjoyed the post. I look forward to writing more material soon. If you have any topics you would like to see covered please let me know!